I’ve been following the impact of the “Podemos” phenomenon on Spanish politics since the European elections late last May. It is not too much of an exaggeration to say that the effect has been revolutionary: the King of Spain has abdicated to ensure that the Succession Law required by the Spanish Constitution would be passed by an overwhelmingly friendly Parliament, something that could not be guaranteed after the next election given the mood of the country. Meanwhile, the Socialist Workers' Party has suffered an almost complete decapitation. Immediately after the election, Socialist leader Alfredo Rubalcaba bowed to pressure to call a party congress to elect new leadership. Since then, the heads of the Catalan Socialists and the Basque Socialists have also resigned, while the heir apparent – Susana Díaz – has elected to stay in Andalucía rather than assume the Herculean task of turning around the failing fortunes of the party. Podemos has continued to grow after the elections. Far from being the beneficiary of a throw-away protest vote, two recent surveys show the insurgent party of Pablo Iglesias improving on the 8% of the votes they received in May to take between 13% and 15% of the vote. The reaction from Spanish conservatives has been vociferous and vituperative: the charismatic Mr. Iglesias has been accused of being in the pay of the Venezuelan government and fomenting a cult of personality, while Podemos as a whole has become the new political boogeyman of the moment. All that is lacking is the accusation of stealing babies out of cribs and robbing the poor box in the churches. The official line of the governing People’s Party has been more moderate, but nonetheless dismissive. Mariano Rajoy maintains his belief that the “protest vote” effect has benefited Podemos, but admits that the economic pain endured by the Spanish people has also contributed to the rise of the leftist party. Mr. Rajoy is confident that the People’s Party will quickly regain its popularity as the economy improves. Let us leave to one side the dubious proposition of Spain’s economy improving fast enough and to a sufficient degree to substantially reduce unemployment in less than 5 more years. 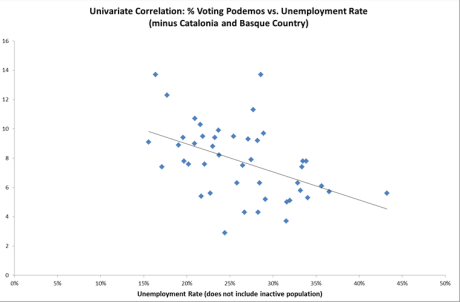 The Prime Minister’s assumptions is based on a composition of Podemos supporters which includes the poor, the unemployed and the marginalized of Spanish society through the effects of the crisis. This would seem to be a logical supposition and the Spanish media and many analysts (including myself) have so characterized Podemos supporters. But is this characterization accurate? Let’s take a look. 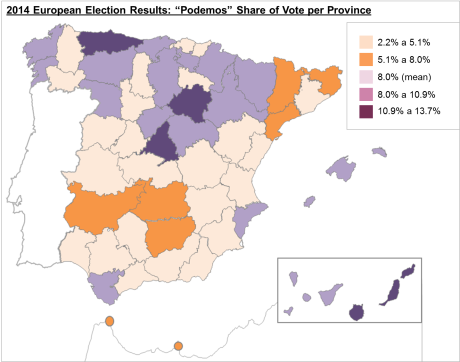 The above is a map of Spain showing the 52 provinces of the country and percentage of the ballots cast that went to Podemos in the European elections. The national average was 8%, but the results varied from a high of 13.7% in Las Palmas (Canary Islands) and Asturias, to a low of 2.2% in Lleida (Catalonia). If the hypothesis is correct, we would expect this electoral map to track well with those provinces in which unemployment were also high. But when we look at the provincial unemployment figures, we find that this correlation does not appear to hold true. 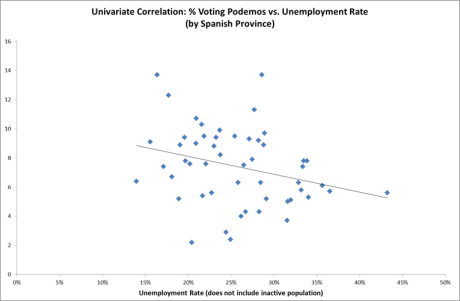 In fact, voting for Podemos appears to be negatively correlated with the provincial unemployment rate. In other words, the lower the unemployment rate in a province, the higher the share of ballots cast for the insurgent party. The interesting results don’t just end there. Another common assumption is that Podemos is feeding off the rage and feeling of injustice generated by the spike in foreclosures and forced evictions of Spaniards from their homes. Since data on actual evictions is difficult to come by, and I could not find it at the provincial level, I used data on total foreclosure proceedings initiated by province in the crisis years. To adjust for the different populations, I took the number of foreclosure proceedings per thousand inhabitants. For the hypothesis to be true, we should see more foreclosures = a higher share of votes for Podemos. We would again be wrong. 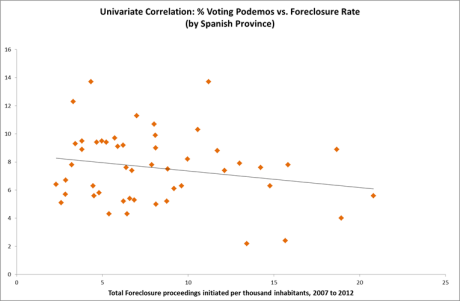 The correlation between foreclosure proceedings in a province and support for Podemos again appears to be negative, though the slope of the trend line is small enough justify a verdict of no correlation at all. This evidence doesn’t actually prove that the hypothesis is wrong; there may be other factors that I’m not accounting for that are confusing the results. 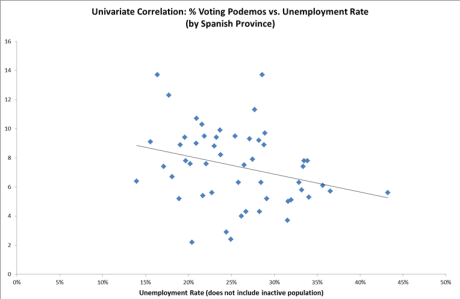 We can say that the link between Podemos voters and the unemployed and homeless is not glaringly obvious. 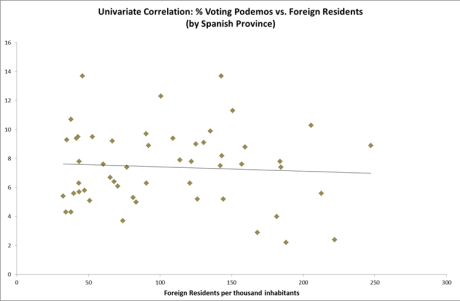 It is also possible to say that Podemos voters do not appear to be of the xenophobic, anti-immigrant type that appears to be driving the success of Marine Le Pen’s National Front in neighbouring France. 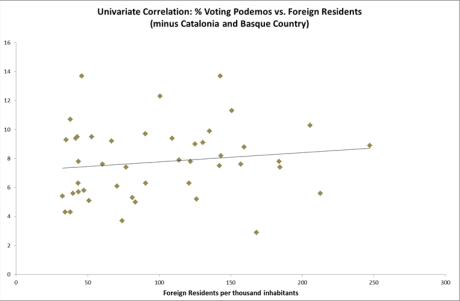 There appears to be no correlation between percentage of foreign residents in a province and the share of votes for the leftist party: any correlation at all, negative or positive, could have been taken to indicate a racial or ethnic bias in the voting, but the flat trend line appears to deny any link. 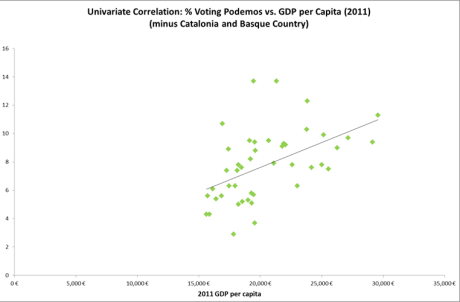 Podemos voters are more urban than rural, though the correlation is weak (above). That’s not really surprising since Spain is heavily urbanized anyway. Rural inhabitants also have a greater tendency towards political conservatism. 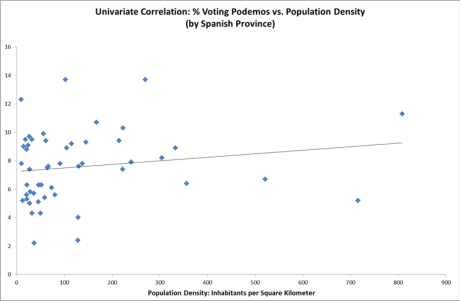 The fact that a left-wing party should be more heavily concentrated in urban areas is hardly news, though Podemos did well in some low density provinces like Soria and Burgos. 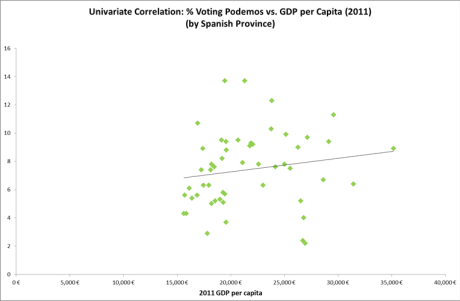 There also appears to be a strong correlation between a province’s GDP per capita and its share of Podemos voters (above). The effect of taking out the wealthy Catalan and Basque areas makes a pronounced difference: without the “noise” made by the regional parties, the correlation between wealth and Podemos becomes much clearer. In conjunction with some of the demographic information provided by voter intention surveys here, we might hypothesize that Podemos voters are middle-aged or younger, mostly urban, from wealthier than average backgrounds. They are not, on average, more likely to be unemployed or dispossessed, or economically marginalized. This doesn’t appear to be a group of proletarians – certainly not the lumpen as Mr. Iglesias has denigratingly referred to them in one interview – but rather middle class people. And if they’re not unemployed and homeless, then they’re upset about other issues: corruption, political elitism, government unresponsiveness, perceived injustice. All of this is very preliminary; there isn’t much in the way of direct voter demographics available yet. Luckily, Podemos seems like it’s going to be around for a while, so we’ll have plenty of opportunity for more rigorous analysis. Still, if these preliminary indications are correct, and the hypotheses that the People’s Party are clinging to are wrong, then improvements to the economy aren’t going to reduce support for Podemos. All successful political revolutions begin with the middle class and then spread. Whether Mr. Iglesias and his party have staying power enough to become rooted in the Spanish political landscape and spread remains to be seen.